Is there a way to make it so a user cannot submit their form if they do not meet specific requirements as defined by the form (in this case it is a job application form - we do not want an applicant to be able to apply if they do not meet our 4 minimum requirements - they are yes/no questions where if the answer is "no" they are not eligible. 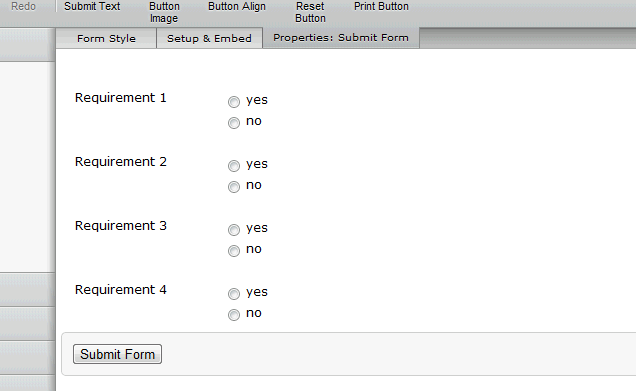 Now set up conditions, that only shows the Submit button when these four requirements are met. Click on the Conditions button , Ensure Show/Hide form field is selected. Add a similar 'Rule' for 'requirement 2', 'requirement 3, and 'requirement 4'. Then select If 'All' of these conditions are matched show the Submit field. NOTE: this functionality is not very user-friendly. I would make sure your form users are made aware of whats going on if they reach the end of the form with no way to submit it. Hope you find that useful, let us know if you have any questions.